Charles Kennedy has resigned as Liberal Democrat leader. In a statement at Lib Dem HQ, Mr Kennedy said he had been "inundated" with support from party members since admitting having a drink problem. But he had decided to quit immediately because it had become clear he did not have strong enough support among MPs. 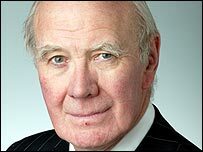 Deputy leader Sir Menzies Campbell has said he intends to stand in the leadership race. Simon Hughes and Mark Oaten could be among his rivals. Mr Kennedy's resignation comes after 25 MPs delivered an ultimatum saying they would refuse to serve on the Lib Dem front bench unless he resigned by Monday. Mr Kennedy had said on Thursday he would call - and stand in - a leadership election after admitting battling to overcome a drink problem. Now he says he will play no part in the contest for the leadership of the party which is the third biggest in the UK. In his statement on Saturday afternoon, Mr Kennedy said he had thought it fair to give party members a say in his continuing leadership. Mr Kennedy said he had enormously appreciated the messages of support received from grassroots members. "However, it is clear now, that such support is not reflected strongly enough across the parliamentary party in the House of Commons itself," he said. "In all of this the interests of the party have to come first. That is where my personal, political and constitutional duty lies." He said he was standing down as leader "with immediate effect". Mr Kennedy stressed he wanted to remain in national and local politics for many years to come. He said he had left the new leader with a "good inheritance", with the party's biggest number of MPs for 80 years. He urged his successor to make sure the party kept to Lib Dem principles and not to get too distracted by the "machinations" of other parties. As Mr Kennedy arrived back at his south London home with his wife Sarah, she said: "I'm very proud of him and what he's achieved with the party." Party president Mr Hughes said the party's federal executive would meet on Monday to decide the rules for the leadership election. Mr Hughes, Sir Menzies and Mr Oaten are likely frontrunners in the leadership race. Sir Menzies, who is acting as interim leader, said he would be consulting his colleagues but intended to be a leadership candidate. Some are hoping the party can unite around one candidate in a "coronation". Asked about that prospect, Mr Oaten replied: "I need to talk to the other possible contenders but I'm in no mood to have a long-drawn-out issue." Mr Hughes has admitted he is under pressure to stand in the leadership contest but was still weighing up what to do. "There are pressures on me from me from both sides both to stand and not stand," he told the BBC. But he added: "Today is the day for saying thank you to Charles.. for his service and supporting him and Sarah. Today is not the day for moving on and making a final decision about how many people will be fighting to take over". Mr Oaten praised Mr Kennedy for showing "incredible dignity" in his resignation speech. "I just hope now Charles can be allowed some privacy and the party has to unite and move forward," he said. Mr Hughes refused to discuss whether he could be a leadership candidate, saying: "Today is the day to say thank you for Charles." Northern Ireland spokesman Lembit Opik said the MPs who had forced out Mr Kennedy without a leadership vote had "violated" some of the party's values. Treasury spokesman Vincent Cable and education spokesman Ed Davey both said they would be backing Sir Menzies to be the next leader. Mr Cable told the BBC: "It needs to be somebody who is experienced, is serious, is credible, has gravitas. I don't think there is any advantage in following the Tories down the path of youth and inexperience." 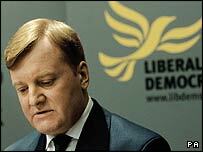 How will history judge Charles Kennedy's six year leadership of the Lib Dems?